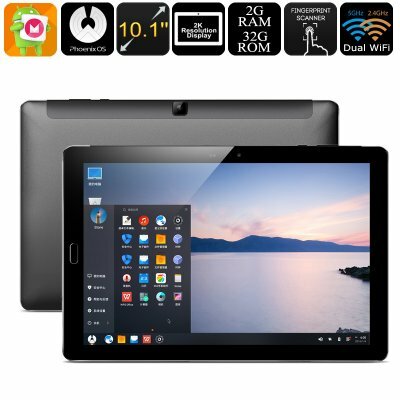 Successfully Added Dual-OS Tablet PC Onda V10 Pro - Android 6.0, Phoenix OS, 2K Display, Quad-Core CPU, 2GB RAM, 6600mAh, Dual-Band WiFi to your Shopping Cart. The Onda V10 Pro offers great efficiency for anybody that wishes to write up files, browse the web, or play games while on the go. Featuring two OS systems, this Android tablet PC allows you to switch effortlessly between Android 6.0 and Phoenix OS – both of which bring along a smooth and powerful user experience that is guaranteed to meet all your demands. With 32GB of internal storage and a 256GB SD card slot, this Android tablet computer packs plenty of space for you to store all your files and media alike. Carry along all your games, apps, and movies – from now on you’ll never have to worry about feeling bored again. When first laying eyes on this beautiful Dual-OS Tablet PC its stunning 10.1 Inch display is sure to grab your attention. Displaying all your media in breathtaking 2K resolution, this screen is guaranteed to lift your user experience to entirely new heights. Whether you like to watch a movie, play a game, or simply like to browse the web – never before have you experienced such great visuals while on the move. Packing an epic 6600mAh battery, this Android tablet PC provides you with up to 4 hours of continuous usage time. This is enough power to get you through the most demanding of tablet usage days without needing to worry about recharging this stunning Android device. Equipped with a powerful Quad-Core processor that reaches clock speeds up to 2.0 GHz, this Android tablet computer lets you enjoy the latest and most demanding software features without dropping a frame. Multitasking has been made possible by the tablet’s 2GB of RAM that, together with its processor, deliver an exceptional experience. No matter what you throw at this tablet computer, there is nothing that will slow it down. In order to provide you with the fastest network speeds available, this Android tablet supports Dual-Band WiFi. Whether you’re at home or in the office, from now on you’ll be able to browse the web and download files in the blink of an eye. Additionally, the tablet features an 8MP rear camera that lets you shoot great pictures and a 2MP front snapper which is perfect for taking selfies and for online video calls. This Dual-OS tablet PC comes with a 12 months warranty, brought to you by the leader in electronic devices as well as wholesale electronic gadgets..